Welcome to this continuing medical education activity titled, "Poly-L-Lactic Acid Advanced Injections Techniques." The following activity is sponsored by Omnia Education and supported by an independent educational grant from Galderma Laboratories. Visit ReachMD.com/Omnia on your computer, Smartphone or tablet device to review the faculty and commercial support disclosure statements, as well as the learning objectives. There you can also watch the video in its entirety to see how, where, and when to inject PLLA. It is recommended you watch this video multiple times and connect with another experienced PLLA injector for mentorship before attempting to inject a patient. Presenting the first case is Dr. Sabrina Fabi. Hello. My name is Dr. Sabrina Fabi, and today we are going to be showcasing the off-label usage of PLLA for the improvement of both chest rhytids as well as medial arm crepiness. Living in southern California, I have a lot of patients that come in complaining of these areas as they start to recognize the discrepancy that begins to exist as we continue to pay attention to facial laxity as well as rhytids and volume loss, and augmenting these areas for the last 12 years, we start to see the discrepancy between photoaged chest as well as hand, neck, including medial arm skin. And so, PLLA in my practice has served as a great tool to be able to really allow the chest and the arms to look better and actually match the facial skin that we end up augmenting and improving with not only volumizers but also by stimulators, light PLLA as well as the lasers and devices that we also have. And so, today we have our patient and what she notices is that she has a little bit of crepiness in her chest and so, when considering the chest we have to recognize that it's very different than facial skin. We have a decrease in pilosebaceous units where in the lateral forehead we have about 292 hair follicles or vellus hair follicles per cm2, in the chest, we only have 22 follicles per cm2. So, there is a decrease in pilosebaceous units and those are the units that really help us heal when we do laser resurfacing procedures or any energy-based device. And so, we have to be cautious when we apply those same energy-based devices on the chest. Because of this we have started to really use devices that don't impair the epidermis when we deliver a treatment whether it's a nonablative laser device or micro-focused ultrasound for the improvement of chest wrinkles. You can also use biostimulators like PLLA or injectables like hyaluronic acid. Because this area does have a decrease in pilosebaceous units, even when you do use a laser resurfacing procedure, in my experience and that reported in the literature, because you have to decrease the density as well as the energy when you're delivering energy in this area, you end up not getting the improvement in chest wrinkles that patients end up going through two weeks of down time and more money to try to improve. And so, because of this we have resorted to nonablative lasers as well as micro-focused ultrasound and the injectables to get the correction that patients are asking us for. Today we're going to be showcasing PLLA for the chest, not only the injection technique but the anatomy that you have to be conscientious of when injecting in this area as well as how you can reconstitute the product so that you can deliver is safely for your patients with minimal adverse events. So when considering the anatomy of the chest, in addition to a decrease in pilosebaceous units, we also have a thinner epidermis and dermis. The epidermis has been found to be roughly between 39 to 44 microns. The dermis is anywhere between 1,300 to 1,400 microns and so, you're dealing with a lot thinner skin than areas like the cheek of the face. And so, because of that, again, energy-based devices are limited because you cannot apply so much energy as the thickness of the skin is not that thick. Right below the dermis you have the subcutaneous fat and that thickness of the subcutaneous fat layer in the chest varies from person to person but, overall, is relatively thin when you compare it to an area like the cheek. Immediately below that, depending on where in the chest you are, but for the purposes of where we are going to be injecting which is the middle of the chest between the sternoclavicular joint and the fourth rib, what we find is that you have pectoralis muscle fascia that enwraps the pectoralis muscle. Below that, you have a little bit of fat when you're dealing with the area from the midclavicular line laterally and then below that you have the pectoralis minor muscle. And so, those are really the layers that you have and immediately below that you have the rib. So, obviously, you're not going to be injecting product into those spaces for the purposes of what we're going to be doing today and for most purposes when it comes to cosmetic rejuvenation of the chest we stay within the space of the epidermis, dermis and subcutaneous plane. When injecting PLLA into the chest, we classically inject into the subcutaneous fatty layer. Now, because the dermis is so thin, you want to ensure that you're actually injecting it into the subcutaneous fat, keeping in mind that between my epidermis and dermis, I have a thickness of about 1,400 microns immediately above that subcutaneous plane. Initially, it may be a little difficult getting comfortable in what plane you are as you don't want to inject the product into pectoralis major muscle. And so, you can use a 25-gauge cannula to allow you to glide in the subcutaneous plane as a cannula will not allow you to glide easily when you're in muscle or when you're in dermis. I then draw two diagonal lines that really allow me to capture that V of the chest that classically gets a lot of the sun exposure from button-down shirts or V-neck shirts. Although we're featuring PLLA today, volume loss of the chest does not occur in a vacuum. You also start to see brown spots as well as telangiectasias that form with age. So, in an ideal world, to comprehensively address our patient's concerns, PLLA will definitely improve the appearance of wrinkles, folds and crepiness because it's a biostimulator and will stimulate collagen production, but it will not do anything for the brown spots that you see or the telangiectasias. And so, there is a lot in the literature published about the combination approach to address the entire spectrum of photoaging changes that we see on the chest and I refer you to … at PRS 2015 for more information on that. But, classically, I would generally do a PhotoFacial or IPL first to address the brown spots and the redness, and then I would proceed immediately after, on the same day, with PLLA injections so that we comprehensively address all of our patient's photoaging concerns and truly three-dimensionally rejuvenate her chest. It has not only occurred from photoaging but they also occur from positional changes during sleep and, like with everything else on the body, we're losing cortical bone mass, not only of our skull, but also of our vertebrae, and we're also developing muscle atrophy with age. And so, all of these things basically create a platform that is smaller than it once was perhaps when we were in our 20s. And so, the skin, like an envelope, is trying to contract and trying to find tone on a volume that is no longer there. And so, PLLA allows us to really recreate a little bit of that volume that sometimes lasers and devices don't allow us to create. So, here we have one vial of PLLA and it's been reconstituted overnight with 7 cc of bacteriostatic water and we've gone ahead and added 1 cc of lidocaine with no epinephrine. I prefer no epinephrine so that if I ever inject into a vessel I recognize and know that I've gotten into a vessel and that it's not the epinephrine that is taking effect and that's my personal preference. We prefer the bacteriostatic water as opposed to the sterile water because a preservative allows the patient to not be in so much discomfort during injection. Sterile water is what this is FDA approved to be reconstituted with. There is much in the literature to support that bacteriostatic water is safe and effective. After we reconstitute it overnight, because many studies have shown that if you reconstitute for greater than the two hours that are recommended but preferably an overnight reconstitution, we minimize the chance of nodule or papule formation. I end up using one vial for the entire chest. When treating the arms, I may elect to use one vial for each medial arm or one vile split between each arm and then I move on and have them return to the practice at four to six-week increments to continue to add to their effect. After we have achieved the desired effect then I have the patients return anywhere between every 6 months to 12 months in order to maintain their results with a touch up injection. So, before moving on and injecting, it is always important to recognize the side effects from every procedure that we perform. Just like with any of the injectables, when injecting the chest with an injectable, especially PLLA, the risks include bruising, possibly hematoma formation if you get into a reticular vein or puncture a reticular vein as well as swelling as you're injecting up to 16 cc of fluid and so that fluid is not going to be resorbed immediately, it's going to take up to a week in order to be resorbed, and then, obviously with PLLA, there's always a concern of nodule or papule formation, although it has not been reported in the literature when injecting the chest, mainly because papule and nodule formation is classically a conglomeration of PLLA injected into a muscle that's moving or mimetic. And so, in the chest, luckily, unless you inject into pectoralis major, you're not going to be really having the risk of a papule or nodule form. So, as with any area that we inject, we always want to do a thorough prep of the skin to avoid contamination or putting any product into the skin that doesn't belong there. And so, classically, what I do is I do an alcohol wipe immediately followed by a Hibiclens wipe. The way I approach the chest really comes down to my comfort level as far as positioning and ensuring that I'm able to inject the entire area. So, whether I start my injection points laterally or from below really just depends on the person that I'm injecting and the size of the breast as large breasts sometimes don't allow me to inject inferiorly and move up. We have found in our practice since I have injected over 150 patients thus far that you don't necessarily need to use topical anesthetic before injection when using PLLA on the chest. It's just not as sensitive as the face. Sometimes you may want to actually recline your patient and this is classically how I do it in the practice. That way, I have an angle that allows me to cover the entire area so that's what we're going to be doing with our patient. It took a total of about two minutes to perform. At this point, what I generally do is take a little bit of soap, whether it's my Hibiclens or hand soap and I give a nice vigorous massage in the area, almost like a sternal rub but we're not trying to resuscitate our patient, obviously, and this allows them to recognize the depth as well as the intensity of the massage that I want them to perform five times a day, five minutes, for five days in the same area. At this point, I encourage the patient to return within four to six weeks for a second treatment of PLLA to their chest. In the trial that we did, retrospectively, on patients that had had treatment to the chest what we found was the patients usually achieved a one point improvement on a five-point validated Chest Wrinkle Scale when they received up to three treatments with PLLA and so I classically tell my patients that depending on the degree of wrinkles that they started off with and how much improvement they're trying to achieve, it will at least take between two to three treatments to get at least one-point improvement on a five-point scale. So, our 62-year-old patient also notices that she has this crepiness inside of her medial upper arm, again, very tricky because unlike the face, it has a thinner epidermis and dermis as well as a very thin subcutaneous fat compartment. And so, the reason we're probably noticing these crepe-like changes is because just like with every other place on the skin, we're losing collagen of about a 1% turnover rate with each year of life. We're also getting elastin fiber fragmentation from photo damage. And so, because of these two things coupled together with the fact that our bone, specifically the cortical bone of the humerus, is also decaying with age depending on the person and the muscles of the arm also atrophy with age including those of the flexor compartment of the arm which are the biceps primarily. All of these things cause the arm to almost shrink underneath so you just don't have the structure to support the soft tissue changes and then you have the crepiness that results from the decrease in collagen turnover and elastin fiber fragmentation that we see with age. And so, I like to use PLLA in this area. Patients have also used skin boosters, some that have auto injectors, specifically hyaluronic acid products that are much thinner and available outside of the United States to stimulate collagen production in this area when injected intradermally, but, PLLA should be injected in the subcutaneous plane again as it is not intended for intradermal injection. Like the chest, you generally need between two to three treatments to get improvement. Other things you can consider in this area if you have energy-based devices include micro-focused ultrasound as that has been published by Sasaki et al, to improve this area but does require a lot of lines which ends up costing a lot of money for patients generally and can be improved in one treatment. You can also use nonablative lasers but just like any off facial area, you end up having to decrease the density and fluence of your treatments which sometimes doesn't result in optimal results or improvement of that crepiness and wrinkles and can require multiple treatments, again, resulting in a lot of money for our patients. And so, for this reason I like to use PLLA in this area as it has offered very nice results in as little as two to three treatments spaced four to six weeks apart. So, again, just like with every area that we like to inject, I always clean the area first with a little bit of alcohol and then followed by a little bit of Hibiclens just to prevent. And so, for the arms I do like to use a cannula to avoid puncturing some of these reticular veins that do run very superficially especially in some of our thinner and older patients. So I do little numbing pads where I'm going to insert my cannula. And then, I rotate my patient down a little bit. My product has been reconstituted at the bedside so I mix it around; Again, I'm injecting between 0.8 to 1 cc with each glide or linear thread which is essentially between 1 to 1.2 inches long as I don't take out the cannula entirely when I retrograde back. And that essentially concludes the treatment of the medial arm. I injected a total of 8 cc of product into the medial upper arm and then I'm going to go ahead and do that to the other side. I would have our patient return back in four to six weeks for an additional treatment. You’re listening to the continuing medical education activity titled, "Poly-L-Lactic Acid Advanced Injections Techniques." Presenting the next case is Dr. Neil Sadik. As a reminder, we encourage you to visit ReachMD.com/Omnia to view this video in its entirety. Hi. I'm Dr. Neil Sadik from Sadik Dermatology and I've been a leader and innovator in the utilization of Sculptra for facial rejuvenation as well as for all facial rejuvenation as well of the decollete, buttock, cellulite and now we're also working on the utilization of Sculptra for abdominal laxity particularly in postpartum women. What sets Sculptra apart from other filler-type agents? It is the most biologically active agent and we know from studies and from what we've seen clinically that there not only is the filling effect of the product but, with time, because of its strong biologic upregulation of dermal remodeling cytokines that skin quality improves and you'll also get a continual lifting effect over time when this product is utilized. So, it really separates itself in terms of longevity, lasting somewhere between 12 and 24 months, and the average of about 16 to 18 months. Number two, it is very strong biologic activity, in terms of its continued increasing effect versus other fillers which are in a downward slope in terms of their efficacy over time, and, thirdly, its ability to upregulate biological remodeling cytokines that improve skin quality and give you a continued improved lifting capacity over a long period of time. So, now we're going to treat our next patient for buttock rejuvenation using Sculptra. On our setup tray, we have our Sculptra bottle that we reconstitute with 9 cc of bacteriostatic water and then we have our syringes set up. We use an average of three to four bottles per buttock in this rejuvenation procedure. We also have a bland moisturizing lotion as well that will be used after the procedure to gently massage the material in and be sure there are no clumps of material and that it is a smooth, homogenous surface, again, of this large molecular filler. And then I have two sets of gauze pads, one with peroxide impregnated and the other just dry. If there's any oozing, what I'll do is swipe across with the peroxide pad and then come back to the dry gauze. I also have a white marking pencil and I'm going to mark off again the central area of maximal volume loss as well as some natural stepoff areas to be sure I give our patient as even a contour as possible, and that's our setup tray. Buttock contouring is one of the most advanced techniques in aesthetic medicine. The utilization of new generation fillers for not only treating the face but now the increasing need for treatment of all face zones is one of the emerging techniques in cosmetic medicine. We're going to demonstrate today the utilization of Sculptra poly-L-lactic acid for body contouring and show how it can be an important, integral part of body contouring and can really help patients to achieve their goals in a very noninvasive fashion in a very safe and effective way. The three major goals of buttock contouring are the following. The first is projection or volume. The second is lifting or elevation, creating vectoring upward so that there's less hanging or less ptosis of the buttock. And then the third capability is to contour the buttock and fill in the areas of volumetric depletion or, in the case if there is cellulite, any dimpling; all of these three goals can be accomplished by using Sculptra for buttock contouring. When you examine your patient, it's important to examine them both from, again, a direct onset as we're doing here from the posterior point of view as well as to turn the patient to both sides where you may see more accentuation of some of the contact deformities. So, first we'll look at our patient head on; secondarily, we'll move her to the right side and look at her from a side view. It's important to know that almost everybody, in terms of body contouring, as some mild degree of asymmetry. So, in our patient here, there is somewhat more flattening or volume depletion loss on the right side of the buttock compared to the left. So, again, our goal is going to be to elevate the buttock as well as to add some volume to improve the zone of flattening that one can note as both on the head-on as well as the lateral point of view. So, we have used topical anesthetic for our patient. We have left it on for approximately 20 minutes and the next step, again, is we're going to mark the areas that are going to be treated with the Sculptra. So, there are usually three major zones that we outline. The area of maximal volume loss, Then, we usually have a second circle that we draw and that's a feathering or tapering zone. Then, we want to have a natural stepoff to create a very, very natural plateau surrounding that area. One other thing that you might want to consider also marking that I sometimes do is sort of putting some arrows where I think there are areas of maximal elevation or vectoring that are necessary to complete the technique. This is another important part of the procedure. And remember, examine your patient from both head on as well as from both sides as we said because there often is some degree of asymmetry and you need to be able to distinguish that in determining how much product needs to be put in each buttock which is commonly not the same on both sides. Our patient has been cleansed with both Hibiclens and alcohol to decrease the potential of bacterial overgrowth as well as diminution as chlorhexidine has been shown to decrease biofilm reactions when using any of these types of filling agents. So, now we're ready to go. So, we always start by implanting the Sculptra into the target zone first. I use a 90-degree or direct perpendicular implantation and, again, we've numbed our patient with topical anesthesia so she feels almost nothing. I always aspirate before I inject for safety and then I'll use a threading technique to implant the material. I love to exit slowly; one key jewel that I can tell you in terms of technique to minimize bruising is it is not how you enter into the skin surface but how you exit. Slow exit is of integral importance because how you exit the skin determines whether there is trauma to the tissue and we know that bruising occurs because red blood cells, again, move through the soft tissue surface. If you exit slowly, again, in the perpendicular fashion, that's where most of the tissue evulsion or trauma occurs. So, slow exit and immediate compression on the area so that red cells do not have a chance to move through soft tissue will markedly decrease your bruising profile. We're going to use about three to four bottles per side. We want to be sure that we have adequate volume implantation because the major issue that I see on our patient, again, is flattening of the buttock. So, the major thing that we want to correct is her volume loss. Now, when we use Sculptra for treatment of the buttock, we usually recommend three treatment sessions. So, this is only our first treatment session. Each treatment session will continue to give you increased augmentation or volumization and improve the overall topography of the buttock. Remember, three treatments are our normal regimen for buttock contouring utilizing Sculptra and the results continue to improve over time. What's nice about this technique is that there's immediate gratification for the patient but, again, the majority of the improvement continues to occur over time. In contradistinction to hyaluronic acid derivatives, the results with using Sculptra tend to improve over time lasting, in our experience for buttock contouring, any place between 12 and 24 months. So, the average of 18 months is what we tell our patients to expect with this treatment. Patients are actually coming to our facility from all over the world because buttock contouring in a noninvasive, non-surgical way, using poly-L-lactic acid, or Sculptra, and is something that is gaining increasing popularity on a global basis. So, now we've completed our treatment and let's assess our patient. Remember, this is her first treatment session but there certainly is some increased volumization or less flattening of the buttock. There is significant improvement in terms of the contour irregularities or the hills and valleys that she had previously. So, we've improved her volume, she has some slight increased posterior projection as well as some slight increased upward projection. The topography of her buttock now is much more uniform. The last part of our treatment protocol is going to be to massage the area and I'll show you how to do that, again, to disperse the particles and be sure there are no bumps at a later time. First I start out with about a minute or so of circular massage. I use my four fingers and my thumb to go in a circular motion. What you want to do is to disperse all the particles of the poly-L-lactic acid that have been injected. This is a very deep massage. Remember, patients are encouraged to massage at home after. It's hard in the buttock area unless you have a partner, but if there is a partner, we do encourage, again, massage at home for about eight minutes three times a day. So, after I complete this circular zone, then I'll take two fingers and actually separate and, again, this is a deep massage to be sure there are no bumps or aggregates of material. This gives you a very homogenous distribution of the particles and ensures a decrease in incidents of any, again, bumps occurring on the skin surface at a later date. I believe that the most important part of massage using Sculptra is the immediate massage after implantation of material. The at-home massage may add a little bit of value but most, again, of the effect is with the in-office massage immediately after implantation. Our patients can resume normal activities immediately after treatment. The massage should last anywhere between 8 and 10 minutes. It really is a vigorous massage that is employed, and then we'll evaluate our patient one last time when we complete the massage. So, let's review again, Sculptra is used for buttock rejuvenation and has three major effects. The effects that we want to accomplish, the most important effect, is increased volumization of the flat buttock, The second major effect that patients love is also increasing the projection and elevation of the, again, so-called ptotic or depressed buttock. And then finally, and what gives patients great satisfaction is improvement of the overall topography or surface characteristics of the buttock. Remember, our patient had some degree of asymmetry, you'll always want to achieve symmetry, but now, there's very even volumization and even contour characteristics on both sides. It's very important to have the vigorous massage for at least 8 to 12 minutes using a circular and two-hand spreading type technique with a very bland moisturizer. We recommend patients at home massage the area three times a day for about eight minutes. This is a more difficult anatomic area, but if they have a partner that is able to do that, I believe that is helpful as well. We'll then have the patient come back for evaluation somewhere between four to eight weeks for her second treatment session. Important, in terms of technique, you want to use, again, the 25-gauge needle, 1 inch and the depth of implantation of the product should be at the deep dermis to dermis subcutaneous interface between four and six millimeters from the skin surface. The target and stepoff zones that we outlined are treated with perpendicular injections with aspiration after each injection, although this is a very safe anatomic vascular zone, the last part of the treatment was the upward vectoring and is done more at a 40 to 45-degree angle and, again, after the treatment is completed, massage is indicated. The patients then can resume normal activity and then they return, again, somewhere between four and eight weeks for the second of their three treatments. You’ve been listening to "Poly-L-Lactic Acid Advanced Injections Techniques" on ReachMD. To view the video for this activity, visit ReachMD.com/Omnia. Thank you for participating. This step-by-step video reviews the safe and appropriate PLLA injection techniques for two popular, off-label areas: the chest and buttock. While Poly-L Lactic Acid (PLLA/Sculptra® Aesthetic) has been used for non-facial volumization for some time now, there’s a lot of safety precautions that need to be considered to reach the best possible patient outcomes. Reviewing best practices for the off-label use of PLLA are Dr. Sabrina Fabi and Dr. Neil Sadick. Disclaimer: The list of available dermal fillers is continuously evolving. Since this activity was produced, some products are no longer approved by the US FDA or currently marketed, while others have received regulatory approval. Providers are highly encouraged to click on this link to view the FDA’s updated list of injectable available: Dermal Fillers Approved by the Center for Devices and Radiological Health. Board certified in dermatology and dermatological cosmetic surgery; Faculty for UC San Diego Medical Center; Partner at Cosmetic Laser Dermatology in San Diego, California. Served as an advisor or consultant for: Valeant, Galderma, Allergan, Merz. Served as a speaker or a member of a speakers bureau for: Galderma, Allergan, Merz. Board certified in Dermatology, Internal Medicine, Cosmetic Surgery, and Hair Restoration; Clinical Professor of Dermatology at Weill Cornell Medical College; Immediate Past President of the American Academy of Cosmetic Surgery (AACS). Served as an advisor or consultant for: Galderma. Served as a speaker or a member of a speakers bureau for: Galderma. Received grants for clinical research from: Galderma. Jason D. Bloom, MD receives consulting fees from Allergan, Aqua Pharmaceuticals, Cearna/OcuMend, Endo Pharmaceuticals, Galderma, InMode, MEND Nutrition, Merz, Remedly, Revance, RightResult, Sinclair, and ThermiAesthetics; is a speaker for Allergan, Alma Lasers, Galderma, InMode, Merz, and ThermiAesthetics; conducts contracted research with Allergan, Galderma, and Zeltiq; and has ownership interest in Cearna/OcuMend, MEND Nutrition, and Remedly. 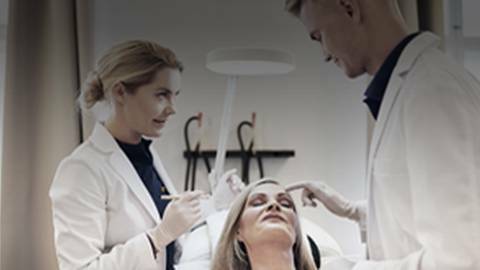 This activity is designed to meet the educational needs of dermatologists, plastic surgeons and aesthetic health care professionals including nurse practitioners, nurses, physician assistants, OB/GYNs, and dentists throughout the U.S who have experience injecting fillers and Poly-L-Lactic Acid. The Omnia-Prova Education Collaborative, Inc. designates this enduring material for a maximum of 1.0 AMA PRA Category 1 Credit™. Physicians should claim only the credit commensurate with the extent of their participation in the activity. This activity is supported by an independent educational grant from Galderma USA.